The hottest items in the Starplaza will be posted here. These items are ON FIRE, so get them soon, before they come unavailable. These guitars are the Numero Uno must have on our July list. 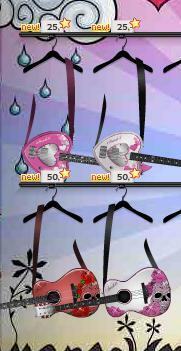 The two heart-shaped guitars are 25 Stardollars each, the pink guitar and the red guitar are 50 Stardollars each. All guitars are Superstar (urgh!) and available at Evil Panda, but not for long! They will only be up for sale for a few days, then they will disappear FOREVER! If you're superstar, make sure to invest in one of these collectibles. With an outfit like this, your MeDoll looks just like a rock star.